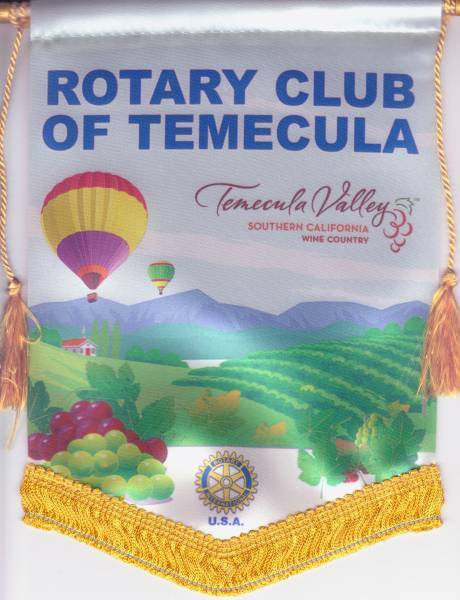 President Chris & Hazel visited the Rotary Club of Temecula, a "frontier town" half way between Los Angeles and San Diego in Southern California. After a delicious buffet lunch, during which President Rachel Mason warmly welcomed Chris & Hazel, Rachel proceeded to administer fines to many of the members present for the usual run of minor misdemeanours (e.g. any table which did not have any visitors/guests; and to the Sergeant-at-Arms, who is responsible for collecting the fines - it is possible to pay by credit card - well it is the US!, whose mobile phone went off while he was collecting fines - oops!). The speaker was the Superintendent of the Temecula School Board and he talked about the desperate shortgate of money being experienced by Californian schools - virtually all non-academic programmes have been cut, so there's no Music, Drama, Sport etc. During the general election, Temecula folk will be invited to vote on "Measure Y" which, if approved, would raise money by way of a property tax $10 per $100,000 of house value. This money, it is "guaranteed", would be directed only at Temecula schools and ring-fenced from squandering by Sacramento, the state capital. Many members were sympathetic, but others took the view that Sacramento already received enough money to properly support the schools and a "NO" vote might force them to stop their extreme expenditure on ridiculous projects and spend the huge tax revenues properly.